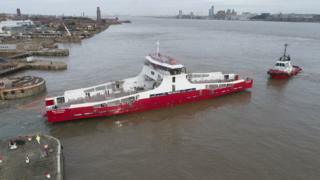 A new £10m ferry designed and built at Cammell Laird shipyard has taken to the River Mersey. The 74m-long Red Kestrel is a freight-only roll-on-roll-off vessel and will operate between Southampton and the Isle of Wight. It was moved by tug boats to a wet basin on the Mersey to be fitted out before it starts service on the Solent later this year. The vessel will officially enter service in May. Cammell Laird's chief operating officer Tony Graham said: "Shipbuilding is back in a serious way on the Mersey and it has been brilliant to see the Red Kestrel being built alongside the iconic RRS Sir David Attenborough."